The most unique window style available is a garden window. It consists of a box of windows that extrudes beyond the facade of your home. They’re often found in the kitchen but can also be used in bedrooms and living rooms as well. Garden windows get their name from their ability to grow plants year round. Your plants will be able to grow better with light coming in at all angles. Plus, you don’t have to worry about Madison’s cold winters preventing you from having fresh herbs and vegetables year round. While garden windows are just a large box of windows, did you know that they’re also considered operable windows? 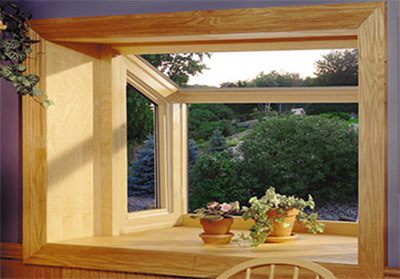 Both sides of your garden window have small casement windows that you can open. This gives you the ability to allow fresh air into your home. As we mentioned above, garden windows are often found in kitchens, so it’s extremely important to have operable windows. When you’re cooking, it gets hot and you could have a lot of steam in the room. This can damage your walls and furniture. Allowing the heat and steam to escape your home is a must. Garden windows are made up of a box of windows meaning you’ll allow more natural light into your home. This is extremely important in a kitchen where you’ll need a much light to see while you’re cooking. Plus, you’ll be less reliant on artificial light which will help lower your energy bills. Window installation is extremely important if you want your garden windows to look and function properly. Feldco ensures your windows will be installed right because it’s done by factory trained and certified professionals. Get a free quote now and rest easy knowing your replacement window project is in good hands.